"Fantastic staff that is very helpful and honest. And the care is top notch!" "Kind caring people. Helped me from the first treatment." "Love this place and would definitely recommend Dr. Nick." "I feel so much better Now that I'm going here. Migraines are gone!" "Everyone is so friendly here! Staff is helpful and social while still meeting my needs." "Best chiropractic and massage therapy business in town. Friendly and welcoming staff." "Am so glad I walked in to their office. Staff is very friendly and there to help." "Dr. Nick and the whole staff are wonderful. You feel like family. Highly recommend." "He treats you like family and all of his treatments and exams are high-class!" "It is absolutely remarkable how well I feel in just a few short weeks." Nick Koinoglou, DC, Dipl. Ac. 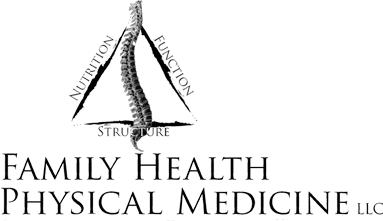 (IAMA), of Family Health Physical Medicine, LLC, has been serving the needs of patients in the Alliance, Ohio area since 1992. As a chiropractor, Dr. Koinoglou, or Dr. Nick, turns to a number of innovative therapies designed to treat a host of pain and mobility issues without resorting to risky drugs or surgeries. From back pain to headaches, Dr. Nick believes that by treating the musculoskeletal system as a whole, he’s not only able to relieve the immediate symptoms, he sets his patients up for a lifetime of health and wellness, avoiding re-injury down the road. Through spinal adjustments, acupuncture, regenerative medicine, physical rehabilitation, and joint fluid therapy, Dr. Nick and his team work tirelessly to restore full function to his patients, allowing them the freedom to move without pain or discomfort. Dr. Nick accepts all cases, including automobile crash cases, workers’ compensation, Medicare, Medicaid, and insurance cases. When he isn’t helping his patients, Dr. Nick enjoys being a father to three beautiful girls and husband to his lovely wife. Neck or Lower Back Pain? "Dr. Nick is so good at what he does. He has helped my back tremendously! I recommend any and everyone to go here, I wouldn't go anywhere else." "I have gone there completely bent over, unable to stand. In a few minutes under his magic hands, I walked out feeling like a new woman." "My whole family has been coming here for years. They really listen to your needs and take their time with you. Highly recommend." "After the course of the treatments I feel great, my back is a lot better and the knee feels great. Thank you Dr. Nick and staff." "Now since I have been getting treatments I wake up without pain and have not had a headaches for a while now thanks to the caring team there. I feel GREAT!!!" "Dr. Nick is a great chiropractor... plus I went there for stem cell therapy! One shot and done to fix my bad knees! So glad I did it!" "In two weeks my pain is minimal! I just got my first injection in my knees; the pain was gone! Wonderful! Give them a chance to help YOU!" "Dr. Nick and his staff are outstanding. They not only do a great job professionally, but everyone is helpful and caring with every patient!" "If you want the best care possible, by the best chiropractor ever and if you want to be treated with kindness... stop here. There really is no better place to go." "This is by far the best doctor ever. Dr. Nick himself is a very wonderful down to earth guy. I have came a long way in the three weeks that I have been seeing him." "Dr. Nick Koinoglou's office is fantastic!! Massages, acupuncture, chiropractic treatments, and a laser! Pain is instantly gone! I wish I could give this 10 stars!"